Piper (SS-409), ex-Awa, was laid down 15 March 1944 by the U.S. Navy Yard, Portsmouth, N.H.; launched 26 June 1944; sponsored by Mrs. Charles W. Wilkins, wife of Captain Wilkins; commissioned 23 August 1944, Commander B.F. McMahon in command. Although built late in World War II, Piper completed three successful war patrols before the cessation of hostilities, operating as a life guard for plane strikes and as an advance picket for fast carrier tasks forces. Piper began her war career on 25 January 1945, when she slipped out of Pearl Harbor as the leader of a five ship wolfpack. The mission was an anti-picket boat sweep in preparation for carrier strikes on Honshu. After a short stop at Saipan, the pack arrived in the assigned area south of Iwo Jima 10 February. Three sweeps from 10 to 13 February revealed no picket boats. Piper spent the period from 15 February to 24 March off the south and southeast coasts of Honshu serving alternately on independent patrol and lifeguard duty for the then intensive B-29 and carrier strikes against Japan. On the night of 25 February, Piper found her first target. In a night surface attack, she sank an unidentified 2, 000 ton vessel. The last four days before departure were spent guarding the approaches to Bungo Suido against a possible Japanese sortie on the badly damaged carrier Franklin. Piper arrived at Midway 30 March 1945 for refit and training, and departed 26 April for her second war patrol in another wolf pack. The ships arrived in the patrol area, the Sea of Okhotsk, 3 May 1945, and from the 14th to the 25th made concentrated surfacesweeps of the area. The remainder of the period was spent on independent war patrol, rotating stations. On 27 May the Piper got her first chance on this patrol when she sighted two small merchantmen with two escorts in Boussole Channel. Working her way through a heavy fog, she launched a surface torpedo attack, sinking one 4,000 ton merchantman. The escorts dropped a few depth charges, but none were close to the mark. The Piper departed the area 4 June 1945, arriving at Pearl Harbor on the 13th. On 19 July 1945 she departed on her third war patrol, stopping enroute at Guam for advanced training from 1 to 4 August. On the 11th, Piper accounted for two five ton fishing vessels in Koshiki Kaikyo, and on the 13th she entered the Sea of Japan. There she rescued six prisoners of war, and Japan capitulated the next day. On 3 September she headed for Pearl Harbor and onward routing to the United States. Piper arrived 15 October 1945 at the U.S. Naval Submarine Base, New London, Conn. During the next five years, Piper remained in the New London area with the exception of cruises to Nassau, New Brunswick and Nova Scotia, and overhauls in Portsmouth and Philadelphia. On 2 May 1950 Piper got under way for a tour of duty with the U.S. 6th Fleet in the Mediterranean. Upon her return to the States she made a six weeks cruise to Guantanamo Bay, Cuba, for special exercises. In June 1951 Piper went to the Charleston Naval Shipyard for conversion which gave her the streamlined new look and Snorkel gear. For the next few years the submarine operated out of New London along the east coast of the United States and in the Caribbean. In July 1955 Piper got under way for her second tour of duty with the 6th Fleet in the Mediterranean. January of 1956 found her operating in the Caribbean again. From March to September she underwent an extensive overhaul in the Portsmouth Naval Shipyard. On 1 July 1957, Rear Admiral C. W. Wilkins, Commander Submarine Force, U.S. Atlantic Fleet selected Piper as his Flagship. His wife had christened Piper at her launching in 1944. In September Piper sailed for ail eight week NATO exercise in the North Atlantic. In 1958, after completing almost a full year as Flagship of the Submarine Force, Atlantic Fleet, Piper was relieved by Seawolf (SSN-575). On 6 November 1959 Piper departed New London for a three month deployment with the 6th Fleet. Throughout 1960 she remained in the New London area. 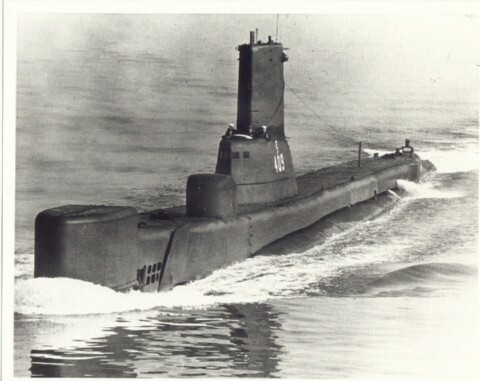 On 20 February 1961 the submarine got under way for exercises in the Caribbean. On this cruise she became the first snorkel submarine to make her 10,000th dive. In the fall of 1962 Piper was deployed in the Caribbean area during the Cuban Missile Crisis. Piper commenced another Mediterranean deployment 8 October 1963. She transited the Suez Canal to Karachi, Pakistan to participate with the Navies of the CENTO nations in exercise Midlink VI and returned to the Mediterranean early in December for operations with the 6th Fleet before returning to New London 1 February 1964. During 1964, in conjunction with Atlantic Fleet exercises, Piper visited Portsmouth, England and Rotterdam, Netherlands. After an overhaul in the Portsmouth Naval Shipyard during the first six months of 1965, Piper sailed for the first of two Caribbean deployments 15 October, returning from the second 10 April 1966. For the remainder of that year she operated out of Submarine School, New London. On 22 March 1967, Piper's main storage battery had deteriorated to the extent that the ship was restricted to surface operations. At this time Piper had made 13,724 dives, a record for commissioned submarines. On 10 May Piper entered the Norfolk Naval Shipyard for deactivation. On 15 June Piper was reclassified to AGSS-409 and the next day she was placed out of commission, special, and replaced Cero as the Detroit, Mich., Naval Reserve Training submarine.